Orlando Augustine Mansfield born 1863 in Horningsham, Wiltshire. Orlando Augustine Mansfield was born on the 28th November 1863 the second child of James Pearse and Mary Ann Mansfield in Horningsham, Wiltshire where his father was now the minister of the oldest Free Church in England, now called Horningsham Congregational Church. He was obviously a talented musician and was probably playing the church organ at a very early age. His son Purcell followed in his footsteps and he kept a scrapbook of newspaper cuttings which included many references to Orlando. 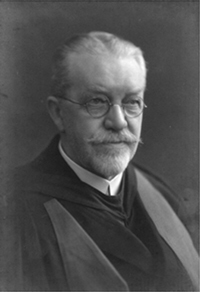 Before he was 21, Dr Mansfield passed examinations for F.R.C.O. and L. Mus. T.C.L. In 1887 he graduated Mus.Bac of Trinity University, Toronto. In 1900 he was the only successful candidate for the degree of Mus. Doc and the same year he obtained the L.Mus. L.C.M. On the 28th December 1886 he married Louise Christine Jutz who was born in Geneva, Switzerland but had removed with her Mother, Elizabeth to Clifton, Gloucester. LDS records suggest they married in Geneva but in fact married in the now renamed District of Barton Regis and settled in Torquay where Orlando was organist and choirmaster to Belgrave Church. Orlando had only one sibling, his older sister Theodosia. Little is known of her but it seems she was an English teacher and governess to a Catholic family and perhaps of their influence she became a Carmelite nun at the convent in Wells. My Father Cedric, while down in Cheltenham visiting Orlando after he returned from the States, recalls travelling in a car with his father Purcell and Orlando stopping at the top of a lane. Orlando got out and walked up the drive to a large wooden gate. A small hatch was opened and he spoke to someone for a few minutes then returned to the car. The women he spoke to was his sister Theodosia. We now have more information on Theodosia. See her own page. In May 1912 (aged 48) after turning down many offers from abroad, he accepted the post as professor of music in Wilson College, Pennsylvania, USA at a salary of £700 per annum plus a pension, about £126,000 per annum in todays terms. He later moved to Brenau University in Atlanta, Georgia before retiring to Cheltenham in Gloustershire. Sadly Louise died there in 1933 but Orlando found new love and marriage in a certain Miss Ruby Mary Victoria Squair (or Henderson) in 1936 shortly before his death in the same year on the 6th July. In his life he composed and arranged many musical works, his best known being 'The Students Harmony' a teaching book which ran for several editions.